In addition, the following 22 still-active racehorses died on track grounds from what the industry calls “non-racing” causes. While technically true, morally they are no less casualties of this vile business than the ones above. Have you ever heard the expression “if you’re not part of the solution, you’re part of the problem?” Instead of sitting around making lists, why don’t you DO something? With all your followers, collect some money and rescue a horse. There are plenty of them out there in danger. You have a bully pulpit here that could be far more useful than just words. One life saved is STILL one life saved. DO SOMETHING! Jeanette Jackson, I have been involved in saving racehorses since I founded the first CANTER program in 1997 and despite all of the affiliate programs and other racehorse rescues in this country and all-breed rescues, it is not possible to keep up with saving the 20,000 plus racehorses foaled each year that begin training at 18-months of age. I resigned from CANTER in 2006 and removed my muzzle to be able to expose what I saw every day at the racetrack. Nothing changed because I could not reach the masses to let them know how deadly racing is even with emails, letters, phone calls, posts, blog comments and still try to save horses. There was NO ONE at the helm doing the necessary nationwide investigations, hours of preparation of Freedom of Information Act requests (racing is adept at hiding their dead), doing the statistics, and presenting it factually because WE were too busy picking up the broken bodies as boots-on-the ground. 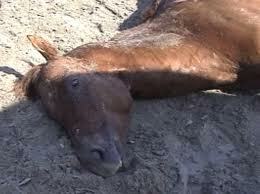 There are only so many hours in a day yet KNOWLEDGE of what is happening to the racehorses can end this carnage. People did not have that knowledge before Horseracing Wrongs and people cannot demand an end to the use of living beings as disposable gambling tools unless they KNOW about it. Sure, they might know about the high-profile deaths seen on television but have absolutely no idea of the thousands that die across this country in training and racing and remember that for racehorses, the finish line remains the slaughterhouse. More racehorses die there each year than in racing yet that topic is never even a part of the annual summit the Jockey Club has on racehorse welfare!!! Patrick’s Horseracing Wrongs shows the FACTS, the names, the tracks, the trainers, the cause of injury and death and we have made more of a difference in educating the public since Patrick began Horseracing Wrongs than anyone has done that has saved thousands of lives. BOTH must be done to achieve success and it is beyond my comprehension that you could throw out a platitude to someone who has made more of a difference in public opinion on horse racing than anyone else in the world. In 2012, frustrated that not only horse friends but family and non-horse friends had absolutely no idea that horse racing is the same as dog racing, I thought writing a book about my experiences as a racing breeder, owner and elected member to my states two prestigious racing boards and how I quit after the horrors I observed daily in order to found CANTER. I hoped my true story, I named Saving Baby-How One Woman’s Love for a Racehorse Led to Her Redemption http://www.savingbaby.com would help INFORM and make a difference. If you read the reviews on Amazon (5 stars and also a Reader’s Digest featured book selection) it has made a difference to readers who had no clue what racing was really until they heard it from a former racing insider. Also, because a portion of my book helps fund Saving Baby Equine Charity http://www.savingbaby.org which helps all horses, we recently saved two racehorses by sending money to two different rescues who saved them at slaughter auctions. However, Patrick’s daily blog has change thousands and we have a movement now that includes other countries. By the way, I am STILL saving racehorses and I assume YOU are also saving “one life” and I applaud you but Patrick is saving thousands through information and education. 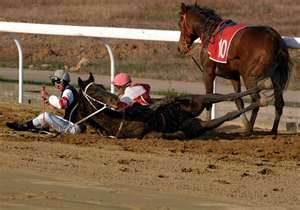 We would return to the “dark ages” of knowledge of racing injuries and deaths if Horseracing Wrongs did not exist. Thank you, Patrick, for saving far more lives through your unpaid dedication to being the horses’ voice as they have no choice. Not everyone has the money or means to rescue horses discarded by the racing industry. But shared awareness thru education, is a way for all to help that otherwise could not. Without Horseracing Wrongs, the dead swept under the rug would continue pile up in the dark, never being exposed to the light of day. Thank you Patrick! Exactly, 20yr+…thank you, Patrick, indeed. Grateful to you 20+ Insider for your insightful comments based on direct experience – the best education of all. Moreover, you are compassionate enough to share those experiences on this Blog. Direct experience supported by facts are indisputable, and sadly the truth for these racehorses who are DYING for bets. They are reduced to gambling pawns for the connections while being doped into the ground. The connections are merely conduits of the ongoing abuse, cruelty, pain, suffering, whipping, doping and/or DYING. This, my friend, is horse racing. Jeanette Jackson…You do realize that the term you use ‘Bully Pulpit’ is here on Patrick’s Horseracing Wrongs KIA list? Without this site, without Patrick’s work, he would already been forgotten. Jeanette Jackson, Clearly, you have not been part of this group very long. Patrick spends a great deal of time making lists and writing articles. What he does is a Labor of Love. What he is doing is helping to enlighten MORE people to the reality of the ABSOLUTE EVIL of horseracing. The more people realize how abusive horseracing is, the more they will STOP going to the racetrack and contributing to the ABUSE of horseracing. The goal of this group “Horseracing Wrongs” is to END horseracing forever. There are many people on this list that have been rescuing horses for years. Tens of Thousands of horses have been rescued over the years. Tens of Thousands more go to their death at the racetrack or by being brutally murdered for food in Canada and Mex. As long as people keep going to the racetrack, the abuse will continue. Patrick is doing a tremendous service for horses by working tirelessly FOR FREE to educate people. What Patrick does is a great deal of work. Please see Below under DATA. An Example of US Thoroughbred Horses Slaughtered . Horses are Sent by the thousands to Mexico and Canada to be brutally murdered. There is NO other website like this that does this kind of research and makes this kind of List and exposes day after day, week after week, year after, the abuse at the racetrack. I never went to a horserace because I knew even when young (50 plus years ago) that horses were drugged illicitly. Horseracing Wrongs and snctuaries I support taught me so much more about racing and I am horrified they are legal in the United States. The main thing I’ve learned is that horses are overbred for this industry, and this industry exists to prifit a few at the peril of many thousands of horses (snd jockeys). I support horses in sanctuaries that I do not “own”, I did not “breed”, and I want nothing from except they enjoy their lives. Sanctuaries are few and far between and the racing profiteers take no responsibility for ensuring horses who cannot race are retired annd cared for. There are many other sordid details of this industry that horse lovers should be aware of. Horseracing Wrongs educates people in order for them to stop patronizing cruelty. Jeanette Jackson, have you never heard of grassroots activism?…or that knowledge is power and there is power in numbers? Patrick’s “sitting around” has educated countless individuals on the PROBLEM – that a gambling industry is crippling and killing non-consenting sentient creatures in alarming numbers. While you suggest a Band-Aid for a massive hemorrhaging wound, Patrick urges a treatment – a “cure”, if you will – that will ultimately end the horrific suffering of innumerable horses. Your comment is disturbing in more than one way…your accusation reveals that in your opinion, being “useful” consists of one thing – giving of one’s money. When I think of the time that Patrick has SPENT in giving a voice to horses HE never benefitted from, I also realize that it’s time he will never get back. But he gives anyway. Each horse’s name he has listed – each one that died for entertainment purposes, a gambling addiction, a job, an ego trip – is deserving of the recognition they get here. And ONLY here. Every single one of those dead racehorses deserved to live…and they certainly didn’t deserve to die in anonymity. But it’s clear that isn’t important to you. Finally, there’s a crippled TB mare, injured and discarded by the racing industry that a few of us are currently helping. I never asked Patrick for financial assistance for her although much is needed – yet, his donation was the FIRST one I received. So now, Jeanette, you can “put your money where your mouth is” and “DO something” – her transport to safety is $270, her quarantine board bill is $400, her veterinary bills for a full evaluation including radiographs for her enlarged, deformed and painful “ankles” are yet to be determined, and that’s just the beginning…you can send YOUR donation for Anita Vacation to me at PO Box 132, Hudsonville, MI, 49426. And there will be countless more maimed and slaughter-bound racing TB’s after her…until this industry dies, at last. Excellent Post Joy Aten !! Grateful to Patrick for all his dedication, and endless UNPAID hours because he truly cares about the DYING racehorses. Grateful to Joy for her excellent comments, and to all of you who rescue the racehorses that this industry dumps when no longer profitable. Jeanette, it’s incumbent upon the racehorse industry to ensure a safe haven for these horses when they are dumped – NOT PEOPLE who had NOTHING to do with the exploitation. In fact, the horse racing industry should be legally mandated to be fiscally responsible for every single thoroughbred that is no longer filling races, and stroking egos. This industry has been irresponsible to the very horse they breed specifically to fill races, and generate profit, it falls upon other people to clean up their mess. Quite frankly Jeanette, I’m sick and tired of cleaning up their mess. Not to mention the small fortune I spent re-homing no less than 22 racehorses that were physically/mentally and/or spiritually BROKEN from this cruelty circus, and death camp. So sad that the racehorses are the ones who suffer because people are up to their eyeballs cleaning up the mess that this industry creates. Why do you pro-horse racing people feel ENTITLED to everybody else, but yourselves? You feel entitled to tax breaks, taxpayers money, casino money, anybody else who will take in a dumped racehorse. “There are plenty out there in danger.” Yes Jeanette there sure is, and that’s because this industry exists. Therefore, it’s up to people like us, this unique BLOG to educate people, and to ensure that every single racetrack closes down.